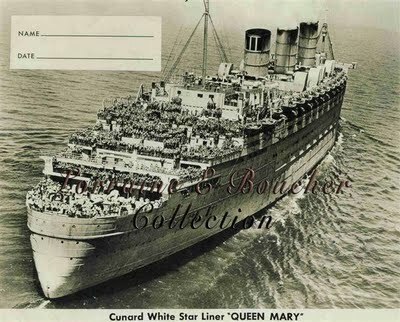 RMS Queen Mary ship was a Cunard ocean liner (now retired) operating Trans-Atlantic crossings in the period 1936-1967 for the Cunard Line (then known as Cunard-White Star). The Queen Mary ship sailed weekly between Southampton and New York City, along with her sister RMS Queen Elizabeth. And if you’re curious about her post-service history – this is the link to our review of the Queen Mary haunted hotel ship story. The first Queen Mary liner was the Cunard’s flagship for 10 straight years – from 1936 to 1946. RMS Queen Mary and RMS Queen Elizabeth were both built to oppose the competition from the ocean liners built in Germany and France in that time. The QM ship maiden voyage was on 27 May 1936. 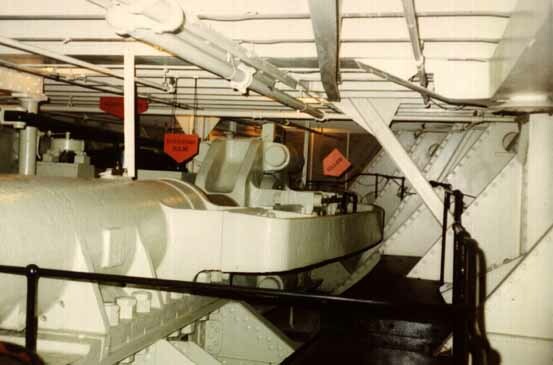 In the years of WWII, the QM liner was commissioned to the Navy forces (also referred to as the Queen Mary troopship or troop carrier) for Allied soldiers. 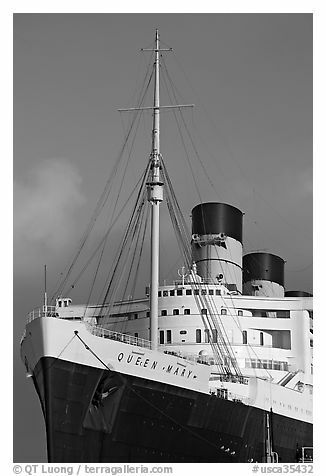 After the war, the Queen Mary ship was refitted to resume its Transatlantic crossings, and along with the Queen Elizabeth liner dominated the market until the jet planes revolution in the late 1950s. After several years of low profits, RMS Queen Mary was retired from service in 1967. The QM liner’s last Transatlantic crossing was on 31 October 1967, sailing for the very last time from Southampton, UK, to USA – only this time she passed through the Panama Canal to be permanently moored in Long Beach, California, where she now serves as a tourist attraction – a ship-hotel and museum. The Queen Mary ship is listed on the National Register of Historic Places. The RMS Queen Mary ship on-board amenities varied according to class. Feature on-board QM facilities were the 2 indoor pools, beauty salons, libraries, kids nurseries, a music lounge, a lecture hall, even a Jewish prayer room, a telephone connection to anywhere in the world, outdoor tennis courts, and of course – the dog kennels. The 3-storied 1st class dining restaurant was the largest lounge. 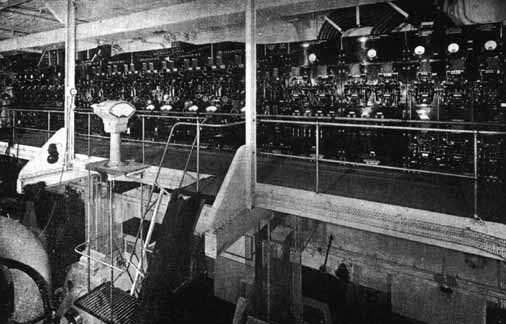 An alternative dining venue was the Verandah Grill (located upper aft on the Sun Deck) – a specialty restaurant with capacity of only 80 guests. The QM ship also had a stylish Observation Bar. The ship’s public rooms and cabins featured Art Deco designs and woods from several regions of the British Empire. Steel construction (hull and superstructure), 3 funnels, 2 masts. Keel laid 1930 (Dec 1), launched 1934 (Sept 26), Inaugural Voyage 1936 (May 27). Hull Number 534. Hull plates sizes and thickness: vary in sizes from 8 ft (2,5 m) to 30 ft (9,1 m.); thick up to 1,25′ (3,2 cm). QM weight – Tonnage 81,237 GT, rudder weight 140t. draft 39 ft (12 m). engines – 4 sets of Parsons steam turbines (single reduction, combined power 160,000 shp (119,300 kW). normal (service) speed – 28,5 kn (33,4 mph, 53, 7 kmph). RMS Qeen Mary ship was built by “John Brown & Co Ltd” in Clydebank (Glasgow), launch date 26 September 1934.
number of cabins – 776 cabin class (1st class), 784 tourist class, 579 3rd class cabins. QM ship passenger capacity 1957, staff and crew 1174. During WWII she was better known as the “Gray Ghost”. In her 31 years of service, the QM ship had 33 captains/commodores. current address: 1126 Queens Hwy, Long Beach, CA 90802, USA. the most fun QM ship facts: number of portholes (~2000), number of rivets used (~10 mill), number of boilers (27), capacity of QM lifeboats (145). 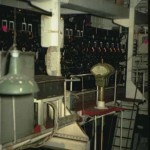 The Cunard QM ship steam whistles were 3 (monted on her funnels – 2 on the forward, 1 on the middle one), sizing ~6 ft in length (1,8 m) and with weight 2,205 lbs (1,000 kg). 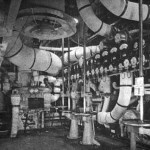 The Queen Mary 1 ship used to have the world’s largest “power train” (a term for the whole complex of machinery rooms for the ship’s engines, water plant, generators, steering gear and boilers) ever installed on a passenger ship. 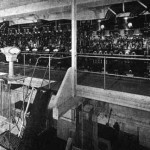 It was located in the QM’s lower 5 decks, and it was the one powerful reason RMS Queen Mary to grab the Blue Riband from SS Normandie for the fastest Transatlantic crossing by ship – and to hold it for so many years. 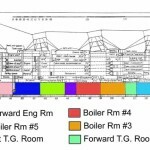 (for propulsion) 4 boiler rooms, each equipped with 6 “Yarrow” steamboilers – these are the rooms listed as 2, 3, 4 and 5 on the plan-photo below. 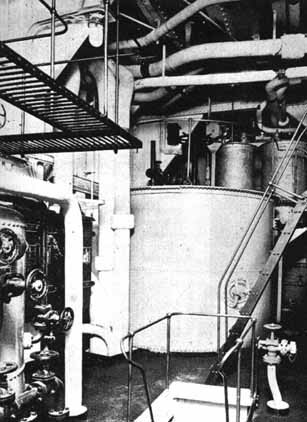 1 auxiliary boiler room equipped with 3 “Scotch” steamboilers which generated the electrical power for the QM ship’s onboard passenger services (room 1 on the plan-photo). 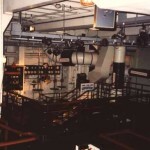 2 rooms for the ship’s electrical turbo generators. These are marked on the plan-photo as “Forward TG Room” (providing power for the “passenger” services), and the other one as “Aft TG Room” (providing power for all the rest “non-passenger” systems). 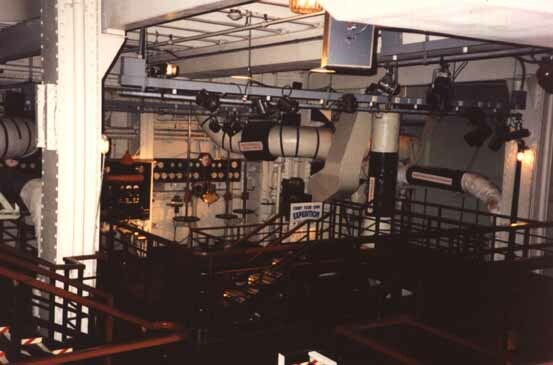 2 engine rooms for the ship’s propulsion units – one Forward (connected to 2 outer propellers) and one Aft (connected to 2 inner propellers). 1 water softening plant with capacity to turn 300 t/per day of sea water into purified feed water for all the 27 steamboilers. 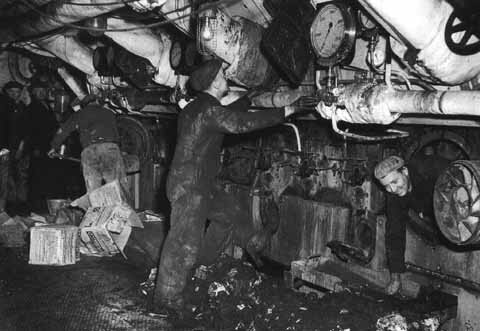 1 Shaft Alley (located portside) – for the 4 shafts connecting the ship’s steam turbines with the propellers. 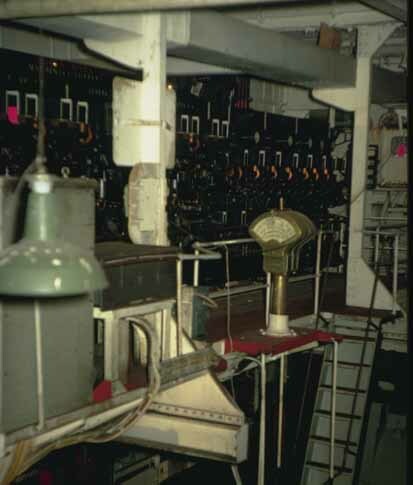 1 Steering Gear Room – which was equipped with a powerful hydraulic system to turn the QM’s rudder and for the ship’s emergency steering wheel. 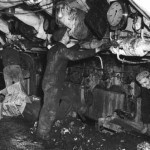 The Queen Mary ship’s power train was removed and scrapped by her new owners. 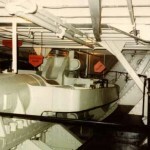 What still remains of it today is the Aft engine room, the shaft alley, and only one propeller. 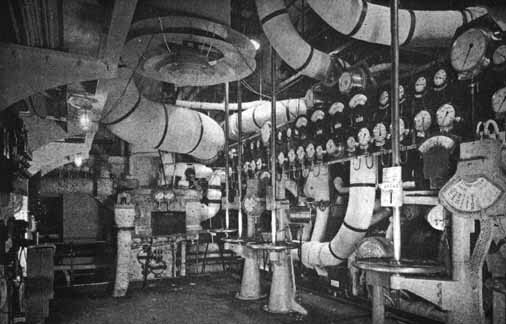 There was a suggestion to leave also the auxiliary Boiler Room to provide electrical power for the new museum/hotel services, but the Queen Mary hotel developers from Long Beach needed more space for all the “ghost stories” attractions – so they scraped this room’s machinery too. Instead, they build a power plant on land (at the Long Beach port’s Pier J). 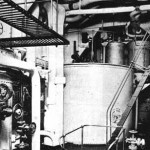 Interesting enough, today the most popular attraction on the Queen Mary ship hotel is that one still remaining engine room. Continuing with the Queen Mary 1 Ship history.